View More In Microcassette Recorders. This usb audio capture recorder digitizer adapter audio converter lets you easily record live audio or transfer analog audio into a computer in selectable digital formats such as MP3, WAV so you can listen your newly-created digital music on MP3 player, computer, portable CD player, or car stereo or home stereo system.Great tool to capture and edit audio to digital format on your computer before transfer to iPod or iPhone or other portable audio players. This easy-to-use USB converter provides users an easy solution to digitize analog audio feed into digital format through the convenient USB interface. There is absolutely no driver installation needed at all for operation in Windows, Mac and Linux OS. Users can easily capture favorite music, sound tracks, audio feeds from audio sources such CD/DVD player, computers, tablets , musical keyboards, Hi-Fi system, MP3 players and save the recorded audio feeds into digital files. Once in a digital format users can use the recorded audio feeds to produce audio CDs, MP3 CDs for playback, editing or CD production.Rediscover the beauty of those good old music with the help of this USB audio capture device. Users may also use this usb audio grabber to convert old collection of cassettes, vinyl records and LPs into crisp, clear digital audio files for music on the go and then create audio CDs and MP3 CDs for personal audio library and make archive of life-time collection that will not degrade or deteriorate over time. 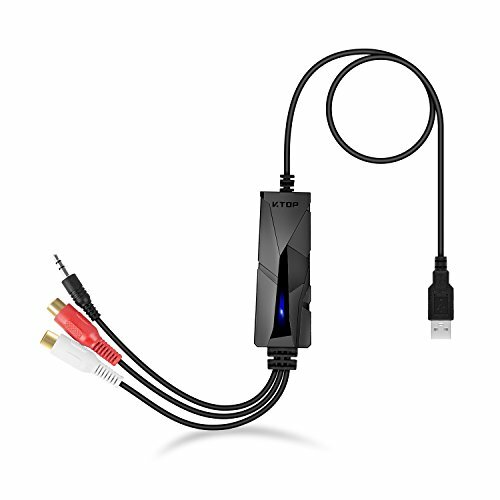 NOTE:DCR-TRV130 requires original i.LINK DV Cable.So AVC0X Does Not Works With Sony DCR-TRV130. USB Audio Grabber - with 3.5mm or R / L Stereo Audio Input - Rrecord & Convert Radio/Amp/Phono/ Music / Voice to Computer for Further Editing. USB Cassette Tapes Converter - Transfer Cassette Recorder Player/Old Cassette Tapes/Radio Player/CD Player/Mobile Music Media to PC,Mac,iMac USB. Professional Audio Capture Convert / Edit Software - Audacity Included or Updated on Official Website. Tape to CD Converter - Supported OS: Windows 10 / 8 / 7 / Vista, Mac OS 10.6 and Above. Note: Because of software patents, Audacity cannot include MP3 encoding software or distribute such software from its own websites. Instead, use the following instructions to download and install the free and recommended LAME third-party encoder to export MP3 files with Audacity. If you have any questions about this product by QH, contact us by completing and submitting the form below. If you are looking for a specif part number, please include it with your message.